A very nice uncomplicated classic Italian side dish. Just a quick sauté of spinach, garlic, hot pepper flakes and olive oil. An effortless side and profoundly delicious. Ambitious as I am about serving greens at dinner sometimes I get stuck in a rut of humdrum salads. I like to serve this as an alternative. In my opinion, leafy greens never require much attention. Steamed or sautéed and simply dressed in olive oil and a little salt is perfect. However, sautéed and given a little spice is a fine improvement. Any leafy green may be substituted and many times I have used chard, kale, mustard greens or beet greens in place of the spinach. Keeping an eye on the greens as they cook is necessary. Some greens such as chard and kale require a little more time in the sauté pan than spinach, beet greens or mustard. 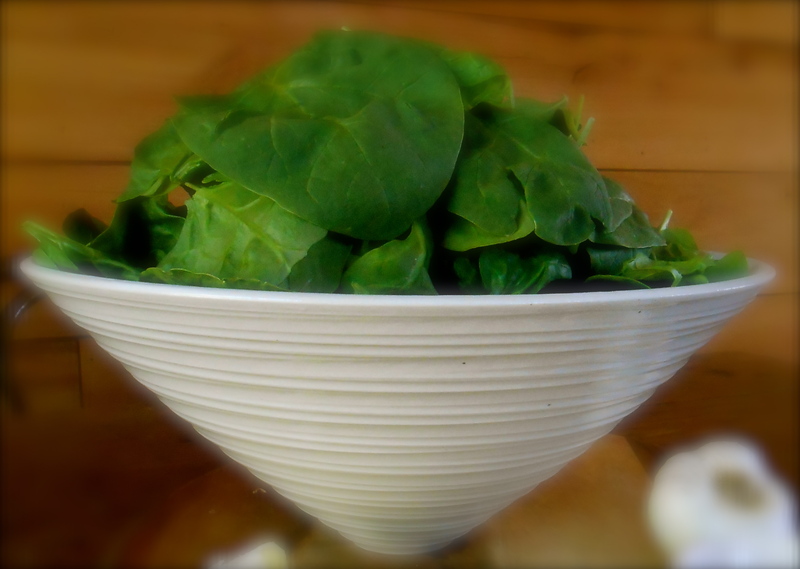 A huge towering bowl of fresh spinach reduced to a small bowl of sautéed spinach. Once the spinach is clean, shake it to remove any excess liquid. A little damp is good for cooking. Warm the oil in a large, wide pot over medium low heat. Add the garlic and hot pepper flakes. Sauté until the garlic begins turning golden. Add the spinach and a pinch or two of salt. Turn up the heat, sauté until the spinach has turned a nice green hue. Serve with lemon wedges. Looking forward to making this dish. I love sautéed greens! Beautiful dish. Thank you Darya. I do too. My favorite way to prepare just about any vegetable! Looks delicious and I’m sure it went beautifully with the chicken(?) we can see on the side! Yum! I too get in a rut with my veggies and usually just do a green salad. This is a beautiful dish and yet so simple! Gorgeous photographs! I am beginning to think “we really are cut from the same cloth”! :) I know I would love to dine in your home. I love spinach with garlic and olive oil. But never used red pepper flakes before. Will have to try that the next time I make it. Thanks for sharing. 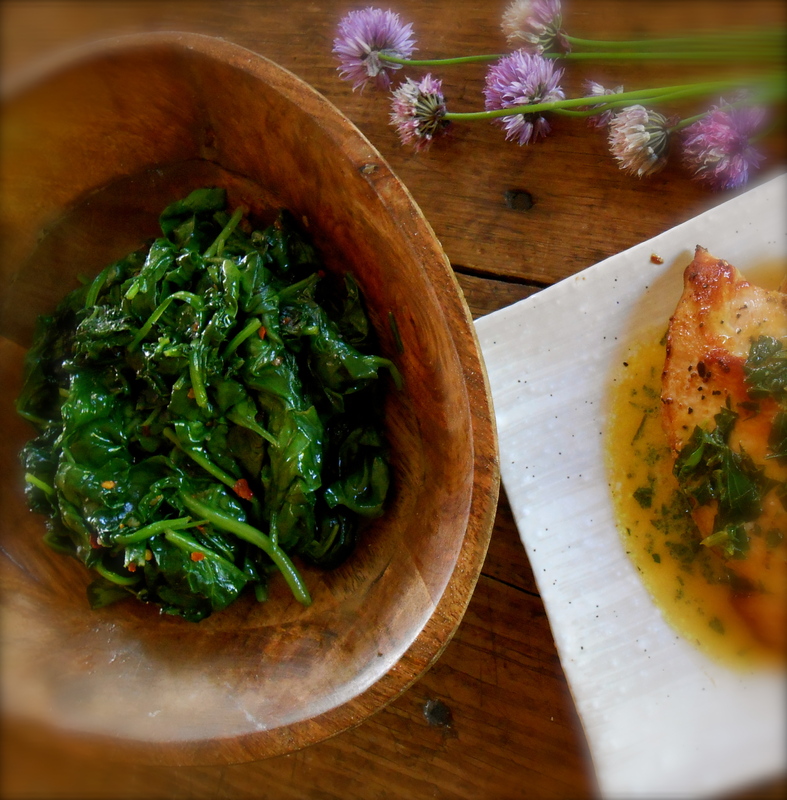 Love sautéed spinach…isn’t it amazing how a huge bowl wilts down so much. Exactly the kind of non-fussy healthy food I’d like to eat right now. Perfect! I cooked your lovely spinach recipe last night to go along with our roast chicken and it was so delicious! It will now feature regularly on our table. Thank you! I think your spinach is very different from what I can get over here. And baby spinach for salads are way to costly to be cooked like that. But I just love this recipe. Yummm…. That is a shame! I have used baby spinach for this recipe too. However, it is not too expensive to buy here in Seattle, Washington. You ARE speaking my language. Simple, beautiful, food. Going to try this with kale tomorrow. Rave reviews for your carbonara recipe, it was dinner tonight! Though there was a moment of panic when we couldn’t find the cheese…someone had stuck it in the freezer! Wondering what you would do with one beautiful walla walla onion? I want our next date to be a leisurely stroll through a farmer’s market (soon! ), while I take notes! I’m so glad the carbonara was a success! Let’s do a farmer’s market right away. Stay tuned…tomorrow I am posting a walla walla onion soup. You are going to need to stop off at the market and pick up two more. (So interesting you should ask) :) I hope your kale is delicious. This looks so delicious! My husband and I love spinach, so we’re always looking for new ways to prepare it. This one is a surefire winner – I love every flavour in this! Thanks lovely! Lovely– my husband loves spinach–and I love garlic. I think we’re set with this one! thanks. so simple, but I bet it tastes so good! it did taste good :) Made it tonight with mostly spinach, but some remaining swiss chard too. Love the super vibrant green color! Sometimes simple is beautiful. Lovely dish. Thank you so much….I agree. The method sounds easy. Im gonna have to try this! You are currently reading spinach with garlic, olive oil and hot pepper (spinaci con aglio, olio, e peperoncino) at COTTAGE GROVE HOUSE.